Kreon Finnancial that started as a conventional lending company in 1994 is on the verge to complete its metamorphosis into a state-of-the-art fintech company. Kreon Finnancial is dedicated to creating an open credit and financial services platform through technology innovations by providing consumers and small businesses with convenient inclusive financial services. This philosophy originated from 20+ years of practice since the establishment of our financial services business, as well as in realising the realities of inclusive financial services in India. Kreon Finnancial leverages cutting edge technologies to engineer lending products as the basis for providing Internet financial services to the public. With the help of cloud computing, rapid user verification, facial recognition and big data analytics, users can enjoy seamless access to Kreon’s financial services. Kreon’s new brand identity, the crown depicts this very core concept, an infinite network. Kreon Finnancial applies Big Data technology to the businesses in its ecosystem. Kreon Finnancial’s latest StuCred app leverages a Big Data model to offer loans. Following a comprehensive risk assessment process drawing on relevant models, user data and other relevant data, Kreon Finnancial developed “2-1-0” online lending, that is, a service standard characterized by a 2-minute application process, and 1-second loan granting and all with zero manual intervention. It aims to provide credit totaling over US$ 20 million to over 10 lakh college students over the next 2 years, helping them tackle short-term financial constraints, emergencies and build a positive credit score even before employment. Big Data technology is deployed in StuCred’s credit scoring algorithm, through processing and assessing vast amounts of data, especially related to the five dimensions of anonymized user credit history, behavioral preferences, contractual fulfillment capacity, identity characteristics and social connections. 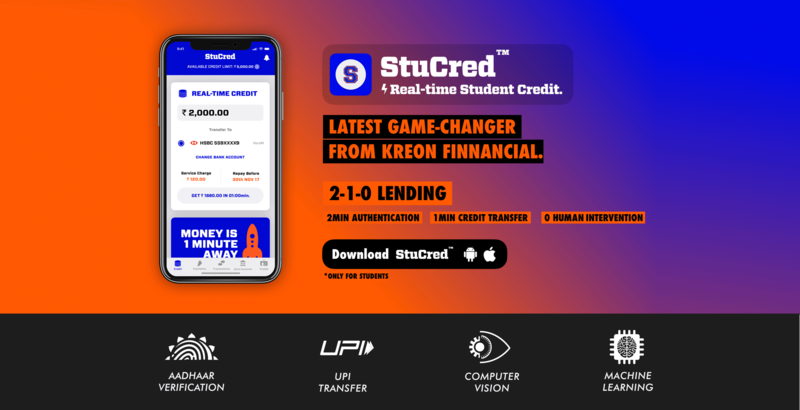 StuCred’s credit scoring algorithm is underpinned by transaction data consentingly derived from the United Payments Interface integration with the service. 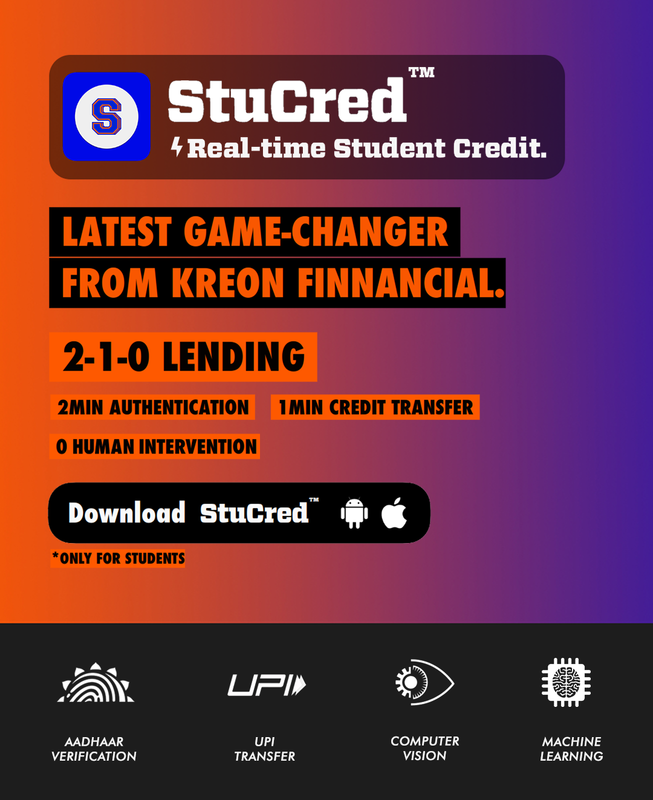 Unlike traditional credit scoring data, StuCred’s credit scoring big data includes anonymized records of real-time credit calculations, actual borrowings, repayment behavior, P2P fund transfers, college information, course information and predictive earning potential. By analyzing huge amounts of online transactions and behavioral data, StruCred can offer credit scoring services for students, and enable online financial enterprises to better measure user’s ability and willingness to repay money hence provide rapid credit and installment payment services for larger credit and assessing employability. Kreon Finnancial is committed to researching and developing advanced biometric-based facial recognition technology and to applying it to online identity authentication, so as to further enhance security and improve user experience. Based on its cutting-edge facial recognition algorithm, Kreon Finnancial has developed interactive face detection technology and image desensitization technology, and has designed a high-concurrency ready and reliable system security structure. Face and identity verification products based on these technologies have been successfully deployed in the StuCred app’s identity authentication processes. The core algorithms involved are the college verification algorithm, image desensitization algorithm and facial recognition algorithm. Satisfying user demands is at the core of payment services. Users require rapid and secure handling of a payment service request. The key issue for the industry is risk control. Established in November 1995, Kreon FInnancial has achieved intelligent risk control with remarkable track records after years of exploration. Kreon Finnancial’s risk control system utilizes historic transactional data for individual cross-reference to improve account security. Roughly 80% of risk-related issues can be resolved in the intelligent risk control process. Apart from this, pre-issue prevention, live issue monitoring and post-issue audits are also very important. Accounts should be classified according to their respective risk rating, and new products will go through review of risk and monitoring strategy. Over 20 servers are deployed for risk monitoring, analysis and treatment. On average, risk recognition and controls can be completed within 100 milliseconds, four times quicker than the blink of an eye. The delinquency rate of Kreon Finnancial is well below industry standards.Kreon Finnancial took the initiative to cooperate with a broad range of partners, including banks, third-party payment companies, risk control-related software and hardware makers, merchants and users, colleges and universities, to enhance security protection capacities within the payment industry. In the past, the difficulty and costs of liquidating, transferring, and storing assets has required lenders to focus on the creditworthiness of their borrower as well as the value of their borrower’s assets. This inefficiency results in limited accessibility to cash and higher interest rates for borrowers. Blockchain as a technology, has the potential to address all these innate intricacies of the lending process. With the inherent concept of open ledger, decentralized platform, smart contracts and integrated central database, blockchain achieves transparency, cost effectiveness, regulatory compliance and risk analysis in the lending process. Blockchain uses cryptography and a distributed messaging protocol to create a shared ledger between trading partners. The trading, either, a simple transfer of asset ownership or a complex transaction is recorded on the ledger in the form of a contract at that point in time. This data on the ledger creates a reliable footprint as it cannot be lost or corrupted by anyone, hence, for the first time in history, there is a perfect form of collateral: blockchain assets. Kreon Finnancial is pioneering an evolutionary leap for lending in which the value of a borrower’s assets are fully recognized and credit history is made irrelevant. © 2016 KREON FINANCIAL SERVICES. ALL RIGHTS RESERVED.